Taking holidays is an important and integral part of working life. For enjoying holidays you need to have facilities of paid leaves as no one likes to forgo the salary. Salaried persons in organised sector as well as in government services including those working in government companies are entitled to avail certain paid leave based on the period of services rendered. These leave may be of different nature like sick leave, casual leave and privilege leave. Some employers allow all consolidated leave to it employees. Liberal paid leaves are part and parcel of incentives offered by the employer to join that company. Employees are not only entitled to avail but also are allowed to accumulate certain leave during their working tenure with the employer. However in order to balance the work and life experience most of the employers allow their employees to encash certain portion of such leaves while mandating them to avail some portion of such paid leaves. The encashment of leave is allowed during continuance of the employment as well as on leaving the job as part of full and final settlement. An employee may leave the job on reaching the age of superannuation or on leaving the job by resigning before reaching the age of mandatory retirement. Income tax laws also give concessional treatment for encashment of such paid leaves by employees. Let us discuss. For all the government employees encashment of entire balance of earned leave at the time of superannuation or on leaving the employment is fully tax free. There is no upper limit for such exemption, in absolute terms, available to government employees for leave encashment at the time of leaving the job either on superannuation or before that. For employees who are not government employees the income tax laws have certain restriction on the quantum of leave and amount upto which you can claim the exemption. For non government employees the leave encashment is exempt only equal ten months of accumulated leave. In addition to the limit of ten months equivalent of salary there is also an absolute limit of three lakh rupees beyond which non government employees can not avail the exemption even if the encashment of leave in terms of number of days does not exceed ten month. For computing exemption the salary drawn by the employee during the last ten months is only to be considered. It may be interesting to note that though employees working in government companies are entitled to claim exemption in respect of gratuity for full amount no such absolute exemption is available for employees of government companies in respect of leave encashment on leaving the company. So people working in railways, government hospitals, revenue department etc. 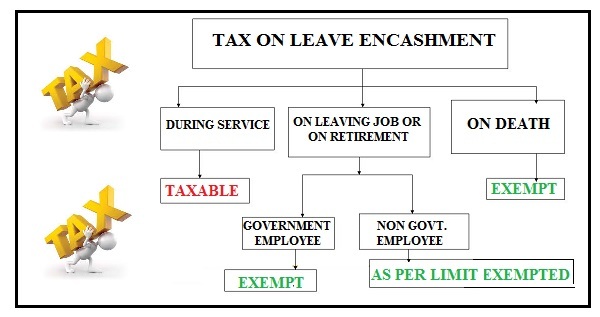 are entitled to full exemption for leave encashment but at the same time employees of municipalities, public sector companies like banks, life insurance corporation of India, and other corporation owned by the government can avail the exemption for leave encashment upto ten months salary only and that too within the limit of three lakhs. The above exemption is also subject to one condition that the entitlement to the earned leave for an employee should be restricted to thirty days of leave for each year of services rendered under the same employer. So in case the employer makes you entitled for leave beyond the thirty days for each year of service, the exemption in respect of the encashment of accumulated leave at the time of leaving the job is not available. As a matter of practice almost all the employers entitle their employees to avail the privileged leave upto only thirty days for one years of service. The amount of exemption for leave encashment available is not with respect to each of the employer but is applicable for all the employers during your life time. So in case you had availed the leave encashment from any other employer in the past, the same shall be reduced from three lakhs and only the balance amount shall become exempt in your hand. Some of the employers do not allow their employees to accumulate leave beyond a certain number of days. However they allow the employees to avail partial encashment of accumulated leave during continuance of their service. As far as tax laws are concerned the exemption in respect of encashment of leave is available only when the cash equivalent of accumulated leave is paid to the employee when he leaves his employment. However no tax exemption is available in respect of leave encashed during the continuance of employment with the same employer. The writer is a tax and investment expert and can be reached at jainbalwant@gmail on mail and @jainbalwant on twitter.